I have used it for a year and it still works great! Product was easy to use and setup worked exactly like the video. My only complaint is that the staples on the box hit the foam bumpers and left holes. I'm sure it doesn't affect the cushioning but it was slightly annoying to receive a superficially damaged product. Still working great! Thank you for reaching out. I really value your product-easy to store and set up, and I havent had a problem transporting any of my bikes. I received the Swayman Bike Rack about 2 weeks ago and it was both easy to assemble and install in the Curt Trailer Hitch Receiver. I had the hitch installed on my 2015 Kia Soul at a truck shop. I love the bike rack. It is very easy to get my bike on and off it plus vibration is minimal when I drive with the bike in the rack. the day we got our bike rack we put in our car and headed out on our first excursion. It works perfectly and is easy to install on my car. There were really no problems at all and we are happy with the product. We use it about every week and are very satisfied. Works great. Fits my 2016 Kia Soul perfectly. I’d highly recommend this product for anyone who wants a sturdy, dependable bike carrier. Great product. Easy to install. This rack locks to the car and it locks my bike to the rack. Now I can leave my bike on the rack without worries. Thule passage 3 bikes carrier is an amazing product. I love the product design, quality and easy to install for use. Great product, high quality, fits our Outback perfectly. Bike fits the rack great. Painless ordering with etrailer and prompt delivery. Only concern was that the shipper banged up the box pretty hard, but the bike rack was not damaged. The bike carrier looks great, and is very sturdily built! Looking forward to many great years of service! Install took me about 20 minutes and it looks and fits great! etrailer.com made it really easy for me to select the right product. Ill give this 5 stars for the durability factor. This rack is well constructed minimal assembly required. There is some swaying from left to right and from reading can be reduced by using a quiet hitch bracket. So I have one on the way and sound promising. etrailer's wide selection of pictures / videos (vehicle specific) made assembly a breeze. Love it. The bike lock is an extra bonus. Easy to order. Great customer service. Fast delivery. Fantastic product. You answered my question correctly, in that the straps were long enough to reach. However, it's a good thing I got the three-bike rack since due to the shape of my car I can only use the cradles furthest from the car. It works, though. Had a successful test over the weekend. I would rate your customer service, "Excellent". Thanks! I recently purchased the Swagman Trailhead rack for two bikes. It arrived quickly and was super easy to attach to my draw-tite 1 1/4 trailer hitch which I also bought at trailer for my 2013 Kia Soul. The whole thing has worked out great. The Trailhead is extremely sturdy and well-made and so easy to use. I have a women's hybrid so I have an adaptor and there was no problem securing my bike to the rack. I just finished driving from Washington to California and the bike barely moved at all. I bungeed the front and rear tires to the rack to keep them from spinning and that worked well. In addition, I bought the hitch lock combo and that was a great purchase as well. My bike and rack are totally secure. I've made four purchases from trailer and they have been awesome each time; friendly, helpful, knowledgeable and speedy! If there was a 10 out of 10 stars, we would give that. After a year of using this rack (Swagman 2-bike with tilt) on our Kia Soul, we think the design, function, and value would be hard to beat. We take it off after each use, no problems at all. The tilt-down feature and stability lock are great. Fit is absolutely perfect. Holds bikes absolutely still. No swaying or swinging. Whole assembly makes me confident in its ability to hold the bikes in place. Very happy with my Thule hitch-mounted, four-bike rack. I used to worry about hauling two bikes on my old strap-on rack, but no more! I've yet to use it with four bikes, but it's handled one, two, and three bikes with ease. It's easy enough to install and un-install for one person, and a breeze with two. I've taken several camping trips during which I get stuff out of and put stuff into the back of my Ford Escape. The rack folds down quickly and easily to make this possible-- getting it almost completely out of the way. The one area that could be better is security. There's no way to lock the rack to the hitch nor the bikes to the rack. Product arrived in very good conditions. Well packed and simple to use. Sturdy but not too heavy. Waiting for warmer weather to start using it regularly. Happy with what I've seen so far. The only thing better than a Saris designed rack is purchasing it from Etrailer. Super fast delivery as well as a good price. This is the 4th Saris rack that I have owned. What I like about this rack is that, like the Thelma series, it holds the bike by the wheels instead of the frame. It can handle any size tire and any type of frame. The SuperClamp enables you to transport any bike that you have. I have this rack on a 1-1/4" hitch fitted to a KIA Soul. It's my first hitch/rack so I don't have anything to compare it with but I find it very easy to use. It has loops on it that allow the rack to be locked to the hitch - peace of mind when left on the car. One of the best things about it is its ability to swing away from the hatchback door. That has been useful frequently. I also use the rack as a bike stand to work on the bike. If you're new to bike racks like this, be advised that you may want to secure the front wheels of the bikes; they tend to move around a LOT if untied. I think this would go for any rack of this style. Super! Loading the rack and the bike takes just a few minutes and expands my biking range tremendously. I love this bike rack. It's so lightweight, unlike my old Yakima Kingpin rack. It's easy to load and secure the bikes, and folds up and stores nicely when I'm done using it. Install was easy nice and secure fit Mini Cooper rack no problem. Would recommend. Could be better if had locking thru axle skewer and the unit locked to the rack, least its not rubber straps holding it down. I've only installed the Trio on my A4 Allroad factory (Thule) crossbars. Haven't put a bike on it yet but install was straightforward and rack looks great. Great design. Very clean. Great price on etrailer as well. Just received packages,excellent quality of rack components. Customer service was great in helping to get the correct rack to fit my car. Sturdy and secure rack for 3 bikes. Easy to load and unload, but heavy to attach to the truck. Holds 3 bikes but two or three may block tail lights of vehicle so you may need auxiliary lighting like this (https://www.etrailer.com/Tow-Bar-Wiring/Optronics/TL21RK.html). Also I put reflective tape onto the rack itself for increased visibility. I like the rack as it was affordable. I tend to leave on my car often and where i live it rains often. The other day i folded the rack all the way down and rust colored water poured out of the base supports. While affordable it was still expensive and would think for what it is, this would hold up better. The bicycle rack was delivered today. After much trial and error I finally got it together and functioning properly. The instructions are little help and I only achieved success after calling Yakima customer service for assistance. On a purely cosmetic issue, the Yakima decal is already half gone. If I were the manufacturer I would like my name ( logo ) applied more permanently. After all the trials and tribulations, the bike rack is first class. To bad the same can't be said for the instructions. It works just fine. A good bike carrier. This is as nice a two bike, platform hitch rack as I've seen at any price. ( Getting it through etrailer made it even less expensive than everywhere else.) Everything about this rack speaks of quality. The only negative review that I saw said if left on the vehicle for a couple of years caused it to rust out. I sprayed WD-40 liquid lithium on the inside of all the steel tubes. (I learned to do this with all my archery tree stands.) I'm hoping that my wife and I are good to go for many years. And the rack sure does look nice on our new VW Tiguan! As great as it ever was. We love it. We love this rack. Sturdy and super easy to load. Folds up out of the way well enough that we leave it on our Accord most if the time. Great Service, your online-Chat recommended the right Bike-Tack für my car. Delivery was very fast and the installation very easy. I called the 1-800 of Hollywood Rack for a couple more questions .... Rick was very helpful and nice. Great product, love it !! I've had this bike rack for a little over a week. I've been very happy with it so far. It was easy to attach to my suv. My bike is very secure on this rack, no complaints. 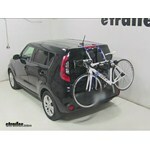 Hollywood Bike Rack Baja 2 Bike Carrier (HRB2) - This is the first product that I have purchased from etrailer. From ordering to delivery, right through installation with concise instructions, my overall experience has been very positive. The bike carrier is strong and solidly built. Very good product! I was skeptical about mounting a bike carrier on my 2013 Camaro 1LE and etrailer.com helped me greatly. This carrier mounts very well. However the bottom straps have nowhere to clip to since the trunk lid is very shallow. After a call to their tech support line they assured me that the top and middle straps are all that's necessary since the weight of the bike does most of the work. After a test drive it stayed mounted as advertised. Not only was their support awesome, once I paid for the order I received an email informing me of the order, that it shipped, and they upgraded me to the next shipping tier free of charge. A great company to work with. Excellent customer service. A rarity these days. Thank you etrailer.com! 3 Bike Hitch Mount Folding Rack w/ Rotating Shank, Frame Mount Cradles for 1-1/4" and 2"
I found the bike rake easy to assemble and to install. It does have some weight to it, heavier than my former rake. Loading and off loading of bikes is easy and it holds them securely with the straps. Excellent quality fits on my Jeep Wrangler Unlimited with plenty of clearance of the spare tire. This was my primary concern, and I had no reason to worry! Today on our 2014 Kia Soul, we're going to be test-fitting the Yakima QuickBack, a trunk-mounted 2-bike rack, part number Y02621. To begin our test fit, we're place the QuickBack directly onto the rear of our hatch. We'll take the hooks labeled top and we'll connect them to the top of our rear hatch. The hooks labeled side will go to the side and the hooks labeled bottom will go to the bottom. With our hooks in place, we'll tighten up each strap a little bit at a time to secure the rack to our vehicle. With our racks secure, we'll fold up the excess strap and place them into the attached clips. We're now ready to load up our bike. Today on our 2014 Kia Soul, we're going to be test-fitting the Thule Gateway, a trunk-mounted, adjustable arm 2-bike rack with part number TH9006XT. With our FitDial set to 11, as per the Thule Fit Guide, we're going to begin the test fit by placing the rack directly onto the back of our hatch. We'll connect the two top hooks to the front top edge of our rear hatch. Side hooks will go to the side of our hatch. Be sure to connect it to the metal. The bottom hooks will go under our hatch. With all of our hooks in place, we'll now tighten each strap a little bit at a time until we have the rack secured firmly to our vehicle. Today, on our 2014 Kia Soul, were going to be test fitting the Thule Archway, a Trunk Mount Adjustable Arm 2 Bike Rack with part # TH9009XT. With our fit dial set to the number 11 as per the Thule fit guide, we're going to begin our test fit by placing the bike rack directly onto the rear of the hatch. We'll take the 2 top hooks, we connect them to the top front of the hatch, and our bottom hooks will go onto the bottom lip of the hatch. Take our side hooks, connect them to the side of the hatch. With all of our hooks in place, we'll tighten them down a little bit at a time until we have the rack firmly secured to the vehicle. We'll now take our excess strap, loop it up, and secure it in place. It's now time fold out dual cradle arms. We'll do this by lifting on the 2 gray levers located on both sides of the rack. 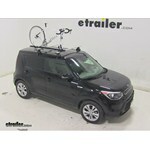 Today on our 2014 Kia Soul we'll be test fitting the Swagman upright roof mounted bike rack, part number S64720. With a Thule Rapid Traverse Roof Rack system on our vehicle, we'll begin our test fit by placing the bike rack up onto the vehicle's crossbars. We'll go ahead and pull out our hardware and starting with the silver U-bolts, we'll go around the underside of the front bar, up through the pre-drilled holes of the head of the bike rack. We'll then take our black wing nuts to thread down onto the silver U-bolts. We'll then repeat the same process for the other U-bolt at the front part of the bike rack. With that done, we'll move to the rear where this time we'll be sliding the silver U-bolt down through the pre-drilled holes of the bike rack. We'll then take the black plate to go up on the bottom side of the rear cross bar and then we'll install our wing nuts onto the silver U-bolts. Today, on our 2014 Kia Soul, we're going to be test fitting the Swagman fork down, a fork mount, roof bike rack, part number S64710. With our Thule Rapid Traverse roof rack already installed on our Soul, we're going to begin our test fit by placing our bike rack directly onto our load bar. We'll bring one of the U bolts around the underside of our load bar, up through our carrier, and we'll hold it in place using one of our wingnuts. Do the same thing on the other side in the front, and then we'll tighten down all four wingnuts to secure the rack to the vehicle. We'll now move to the rear. This time we're going to take one of the U bolts and put it down through the rack. We'll want one side coming out on each side of our load bar. 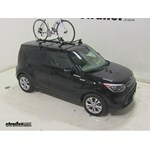 Today on our 2014 Kia Soul, we're going to be test-fitting the SportRack rooft-mounted bike rack, part number SR4611. With our Thule Rapid Traverse Roof Rack System already installed on our Soul, we're going to begin our test fit by placing the rack directly onto our load bars. At the front, we'll bring one of the black rubber-coated U bolts around the underside of our load bar, fit it through the front of the carrier and secure it in place using two of the wing nuts. We'll repeat the same process for the other side of the front of the carrier and then we'll want to snug down all four of our wing nuts to secure our rack to our load bar. With our front secure, we'll move to the rear. At the rear, we're going to take two carriage bolts, place them through our rack. Being sure that they come out on each side of our load bar, we'll then put in the black plastic spacer that will go between the rack and our load bar. Today on our 2014 Kia Soul, we'll be test fitting the Thule Big Mouth roof mounted bike rack, part number TH599XTR. With a Thule Traverse roof rack system on our vehicle, we'll begin our test fit by placing the Big Mouth directly up onto our vehicle's load bars. Starting at the front, we're going to position the L brackets around the front and bottom sides of the load bar, and position the T bolts into the slots of the L brackets. Then we'll tighten down the black wingnuts just a little bit to keep the T bolts from falling out of the slots. We'll then move to the rear, remove one of the black allen bolts, position the black plate on the under side of the rear bar. And insert the remaining bolt into the hole in the plate and reinstall the wingnut. Now we can fully tighten those down and move back to the front to finish tightening the front black wingnuts as well. With everything all tightened down and secured, we're ready to load up a bike. We'll need to undo the front and rear ratcheting strap and pull back on the black handle, which will loosen up the frame clamp. Today on our 2014 Kia Seoul, we're going to be test fitting the Kuat Trio, a fork mount roof bike rack, part number RU01. With our Thule rapid diverse roof rack system already installed on the Seoul, we'll begin our test fit by placing our bike rack directly onto our load bars. Here at the front, we'll bring one of the black, rubber coated metal u-bolts around the underside, fit it up to the head of the carrier and hold it in place by threading on two wing nuts. We'll then repeat that same process for the second black, rubber coated metal u-bolt here at the front. We'll now tighten down all four wing nuts and that will secure the front of our rack to our load bars. We can now move to the rear. Today on our 2014 Kia Soul, we're going to be test fitting the SportRack Fork-Mount roof-mounted bike rack, part number SR4622. With our Thule Rapid Traverse roof system already installed on our Soul, we're going to begin our test fit by placing our bike rack directly onto our load bars. At the front of the rack, we'll bring one of the black rubber-coated U-bolts around the underside of our load bar, up through the head of our carrier and we'll use two wing nuts to hold it in place. On the other side of the front carrier, we'll do the same thing: Bring the rubber-coated black U-bolt around the underside, up through our carrier and hold it in place using the two wing nuts. We can now tighten down the four wing nuts in the front. With those secure, we'll move to the rear. We're going to take two carriage bolts, they'll go down through the rack. Today, on our 2014 Kia Soul, we're going to test fitting the Rocky Mounts Tierod Stretch, a fork mount roof bike rack. Part # rky1011. With our Thule Raptor Traverse Roof Rack already installed on our Soul, we're going to begin the test fit by placing the rack directly onto our load bars. At the head of the carrier, remove the black plastic cover. This will allow us to bring our black rubber coated metal straps around the underside of our load bar, and fit them into the head of the carrier. We'll then use an Allen key on the Allen Bolt to secure the straps around our bar. When we have these tight, we can replace our black plastic cover, then we'll move to the rear. I think this website is very useful for hitches and every other stuff as bike rack and wires harness for vehicle. I would recommended this site to everyone I know.